3 What is a varroa mite? We love our bees. We introduce them to their homes, in the form of a hive. We do our best to ensure they have the conditions to survive. We essentially kick-start what we hope will be a long and enjoyable presence in our gardens, orchards and fields. And we hope they have ready access to the resources they need to become largely self-sufficient and to thrive as a colony. But we also find them fascinating and beekeepers recognize the wonder and effort happening within the walls of a beehive. As each week and month, season and year passes we find ourselves learning more about the fascinating honey bee. The bee does more than create honey – it gives is a glimpse into the astonishing treasures of nature, all in our backyard. But there’s another creature that finds a home in this same small space. It has an incredible lifecycle with a number of tricks up its metaphorical sleeve as it looks to flourish inside the hive. Unfortunately for us – and even more so for our bees – it is the varroa mite. 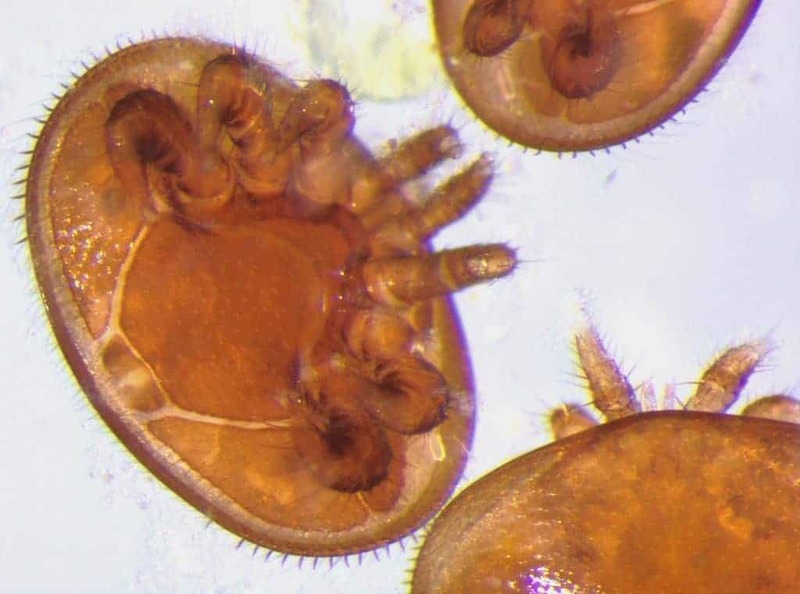 This incredibly damaging mite has a binomial name (a formal system of naming living things with a two-part convention) that seems very appropriate to our English ears – Varroa destructor. It is important for beekeepers to have an understanding not just that varroa mites are a threat to our bees, but why and how. This article looks in depth at the life of this tiny pest. Once upon a time the beekeeping world had no real awareness of the varroa as a threat. Then, suddenly, it hit us … a relatively simple existence free of this threat was suddenly changed forever. In this article you will learn how the varroa goes about her business and the damage she does. Let’s start with some factoids about this damaging mite. The original species discovered in 1904 (Varroa jaconsoni) is a parasite of the Asian Honeybee (Apis cerana). For a long time it was considered to be the same species as Varroa destructor, which is a parasite of both the Asian and the European Honeybee (Apis mellifera). But Varroa Destructor is now understood to be a separate species and the one that concerns us most. As we have seen, the first discovery of the varroa bee mite (Varroa jacobsoni) was as long ago as 1904. This was a parasite of the Asian honey bee, Apis cerana. Over subsequent decades the mite spread more aggressively via the western honey bee, Apis mellifera, becoming established first in Africa and, later, Europe. Varroa destructor was first detected in the U.S. in 1987. Only one continent, Australia, remains free of the mite, however, it is expected to be introduced in the near future and the continent continues to have scares about various reports of the mite. It is now known that at least five species (18 haplotypes) of varroa mites can be found in the tropics. As a simplification, you can pretty much assume varroa mites are a global threat to bees now. Certainly in the US and Europe, for example, any detailed discussion of beekeeping is sadly incomplete without inclusion of varroa. Let’s take a look at the lifecycle of this ruinous but, frankly, fascinating mite. As we will see, there is a cyclical nature to how the varroa lives in and away from bees. Let’s start with a simple and seemingly innocent scenario. Imagine we have a beautiful, bee-attacting plant swaying in the wind, harboring riches of nectar and pollen. A mile or two away, a worker bee has left her hive and is unknowingly going to land on this plant, as part of her foraging trip. So far it’s a positive and happy story of upcoming pollination and the collection of nectar. But our plant is harboring a small, red, dangerous surprise. You have just witnessed a simple and common event – but one that could potentially spell the start of the end for the colony to which this bee will return. The varroa mite on the leaf knows exactly what she’s doing and, as soon as the worker bee arrives, she climbs aboard. From there, she is likely to make it back to the colony with her host bee. And then bad things happen. Let’s continue that story. A varroa that is not in a capped cell – a stage we will discuss below – is considered to be in the phoretic stage. It is the time when the varroa can move around, whether within the hive or, in our example, on the body of a bee. After hopping on her host bee, the varroa will start feeding on its hemolymph (blood). She typically does so through the inter-segmental membrane on the abdomen of the bee, as her host bee goes about her business and eventually finds her way back to the hive. By the way, there’s a qualifier to the statement above about hemolymph. Some recent studies have suggested that, contrary to our belief over decades, the varroa is actually feeding on the “fat body” of the bee. If you are interested in learning more about this, check out this video. Back at the hive, our bee will start roaming around as normal. 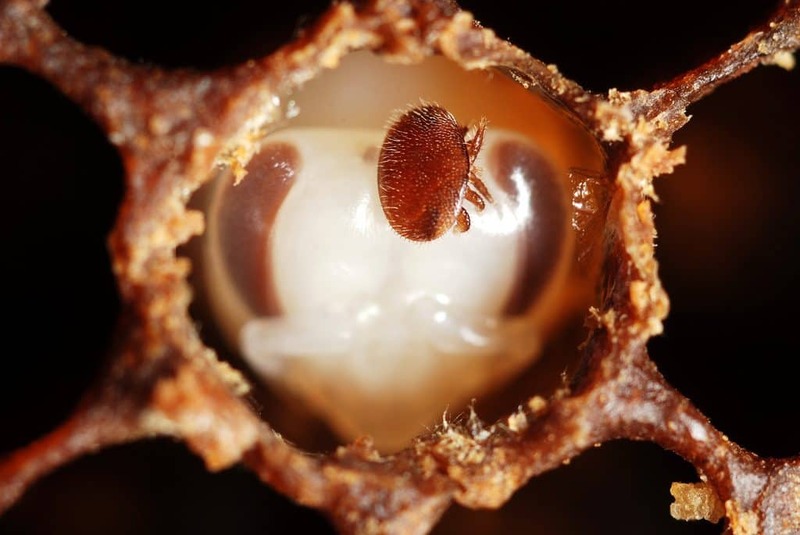 To end her time in the phoretic stage, the varroa mite will seek the confines of a cell. But not just any cell. Timing is everything, as we will see below. First it’s important to realize that to the varroa mite a cell – a capped cell in particular – is where reproduction takes place. It is her intent to locate a cell in which she can initiate her reproductive objective, since she will be free to carry out her business with little risk. 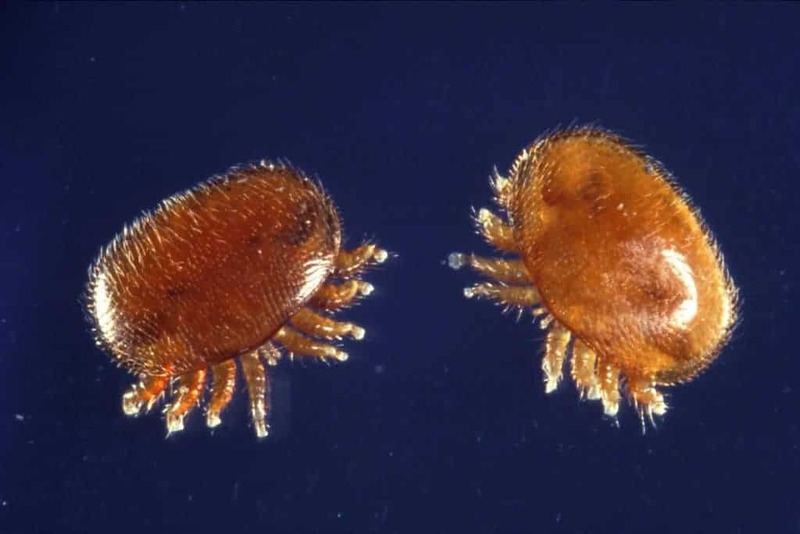 The female varroa entering a call is called a foundress mite. And she does indeed have great timing, in terms of how honeybee larvae develop. Honeybee larvae pass through five stages, called instars. At each of these stages, the larva grows and then sheds skin at the end of each instar. This occurs for all five instars except the last one (the 5th) when she doesn’t shed her skin. 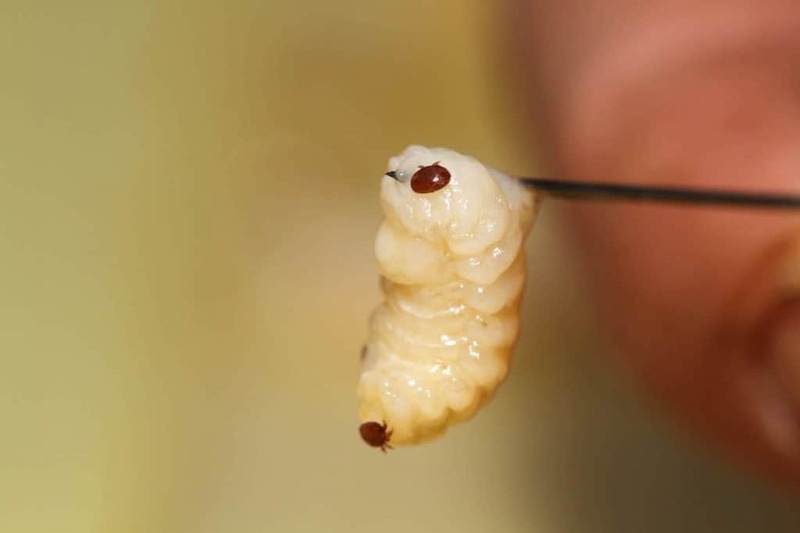 In the 5th instar, the larva emits a pheromone telling worker bees “come cap my cell”. Workers will duly respond by capping said cell, so the larva can safely continue development to pupa and then to adult bee. It’s all good! That same pheromone is ALSO recognized by varroa mites. They interpret the source of this pheromone as a “safe zone” and as a reproductive signal, of sorts. The location from which this pheromone is emited is a cell with a larva and that cell is about to be capped. This is a reproductive goldmine for varroa they have evolved to recognize. As a host bee, carrying a varroa (perhaps the one in the first part of our story, on the flower) passes over a cell with a larva in the 5th instar, the varroa will hop off into the cell. Soon after the cell is capped. We’re left with one juicy larva, one foundress mite…and a predictably sad fate ahead for the larva. Her first task is to get settled! On entering the cell, she will ease herself pass the relative bulk of the larva and nestle in the larval jelly (food intended for the larva) at the bottom of the cell. Then she gets a helping hand from the unsuspecting larva. Specifically, after about 5 hours, the larva will consume the larval jelly which frees the foundress varroa mite from that sticky mess. The varroa has started creating eggs at this point. We’ll see the result of that below. But first the varroa bites a wound in the larva. This wound has many implications. From the varroa perspective, it becomes a well-defined target for the consumption of hymolymph, to sustain infant mites and give them all they need to grow at a rapid pace. But the damage can take a terrible toll on the larva itself. This gaping wound opens the larva to infection. This, in turn, means that an outbreak of many diseases become far more likely. Indeed, these secondary effects of varroa are the major risk to any colony. About 70 hours after the cell is capped, the female mite will lay her first egg. This will be an unfertilized egg and, just like honeybees, unfertilized eggs are destined to be males. She will then lay more eggs, at intervals of around 30 hours. These eggs are fertilized, so become female mites. Each of these eggs will need time to develop into adult mites. The eggs laid later will not have sufficient time to develop before the development time of the bee in the capped cell is too short. As will see, this is why drone larva are an attractive morsel to varroa, because of their location. Next, we take a turn towards the (even more) bizarre. Remember that lone male, laid as the first egg? He has one role – to mate. In fact, he doesn’t even consume food. But where are the females with which he mates? That’s right – he will mate with his sisters, namely the mites that emerge from fertilized eggs laid by the foundress female. He will mature in around 6 1/2 days, after which he will mate with females in the cell. Then he dies. But he leaves behind mated female mites. Females take about 6 days to mate, after which they will likely mate with their brother. They will, of course, gorge on what remains of the larva, as their rich source of food. Numerically, these females are how the real damage happens, not just within the capped cell but in terms of the mathematical game we observe when a single female mite entering a cell morph into many females leaving it, after it is uncapped. That single-cell event repeated many times across a colony can soon overwhelm the colony, if left unchecked. The rapid reproduction of varroa within a worker cell is bad enough. But the larger, more spacious drone cell is an even greater invitation for the varroa. As well as the extra space, there’s also more time for varroa reproduction. A drone cell is capped for around three more days than the worker cell. This allows reproduction to continue for longer for the varroa in the cell, which equates to more mated females. When the cell is uncapped the mated females will leave the cell. At this time they enter the phoretic stage and will search down a suitable host bee. Many will wait till they find another cell that is about to be capped, with the larva emitting their pheromones to inadvertently attract them. Others may find themselves on a host bee that will leave the hive to forage. That is a classic mechanism for how a varroa infestation can spread from one colony to another. Keep that important factor in mind as you consider your role as a responsible beekeeper. It isn’t unknown for beekeepers to lose discipline in their mite counts and, effectively, accept defeat. They perhaps consider their loss to be their business. But the potential for damage can go well beyond their hives. The spread of varroa to other colonies can have a major impact on bees in the area and should not be overlooked. We all have a responsibility to avoid the spread of varroa. Despite this gory and scary story, bees have their own ways to combat the threat of varroa. They do so successfully in many colonies. In fact, the existence of varroa in a hive is a normal, predictable and often quite harmless occurrence. The danger is not that varroa exist – but they exist in sufficient numbers to overcome the defensive behaviors of the colony. A vital part of the dynamic, ever-changing battle in the hive between bee and varroa is that both adapt to their environment. On the negative side, varroa have proven themselves to be very effective at adapting to the various treatments we throw at them! Many “well-proven” treatments have lost their efficiency over time, as the varroa population builds a resistance over many generations. That is something all beekeepers should keep in mind and is a core principle for those following a path of natural beekeeping. More positively, our bees also have options! Indeed, scientists have observed specific behaviors in bees that are more aggressively hygienic in terms avoiding varroa. 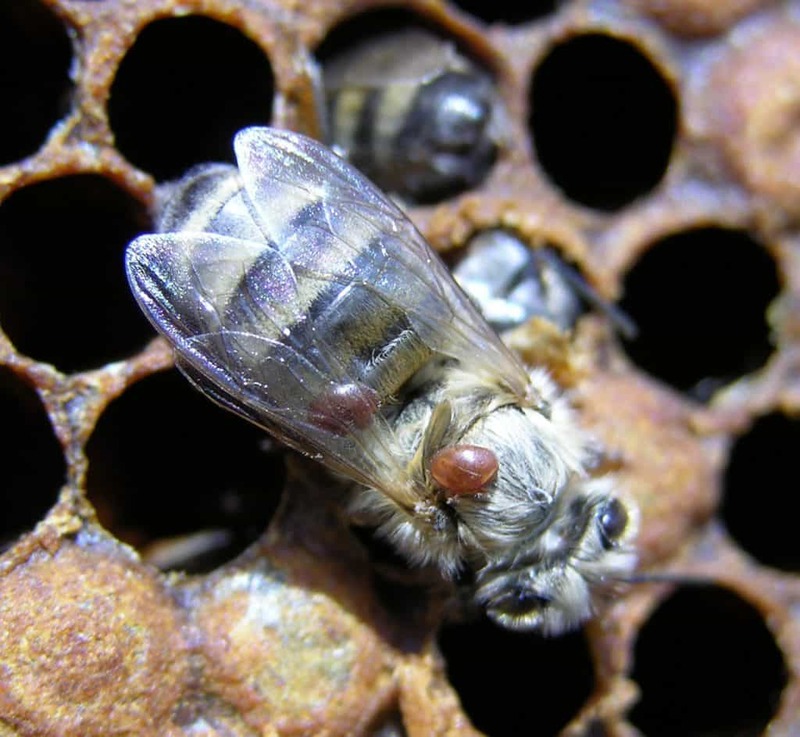 In fact, in recent years there has been a focused effort to breed for these behavioral characteristics, resulting in Varroa Sensitive Hygiene (VSH) bees. Of course, we have options too, as beekeepers. There are many choices – and many philosophies – about when and how we should treat our hives for varroa. There are both proactive and reactive ways to approach this, with the former obviously being the preference. Once the varroa population reaches a certain point, beyond which bees are less able to defend themselves, the downfall of a colony can be rapid. This article is focused on the life of the varroa, so we won’t go into detail here about the many options available to treat varroa. But we do want to illustrate, with one example, how an awareness of the life of the varroa has led to one tactical option for the beekeeper. Remember we mentioned that the larger capacity of drone cell buys varroa more time to reproduce? We can use that to our advantage. A common approach to keeping varroa mites within acceptable limits is to use drone cells as a bait, of sorts, for varroa. By installing drone frames, we stimulate our bees to create more drone cells. This effectively attracts varroa to that frame, to the larger drone cells. After eggs are laid and cells capped, which takes about 11 days with drone cells, the beekeeper can remove the frame and put it in the freezer (this needs to be done, of course, before bees emerge, which is about 10 days later). Placing the frame in the freezer kills the brood and varroa. Thus, a percentage of the varroa in the colony overall are removed and killed. Then the beekeeper can remove the frames from the freezer, uncap the cells and replace back in the hive. Bees will clean up, start rebuilding the comb to its beautiful state before the queen can again lay unfertilized eggs. “Rinse and repeat” this process and you have taken steps to reduce the mite count in the hive. By the way, many beekeepers have a couple of drone frames to they can rotate while one of the frames is in the freezer. This is but one example of how an awareness of the life of the varroa can be used to effectively fight back against the damage it can cause. Be aware of the life of the varroa, since that lends you better perspective on just what your mite counts are telling you, at what times you should be on guard and how you can help your bees in their time of need.